Do you know a Weasel? You know, that person that threatens to take down your organization by using every sleazy tactic in the book to advance their careers regardless of how it affects others? 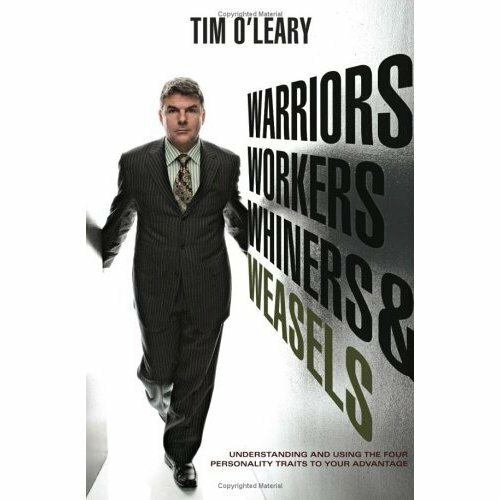 Warriors, Workers, Whiners, and Weasels: The 4 Personality Types in Business and How to Manage Them to Your Advantage by entrepreneur Tim O’Leary takes a refreshing look at the different personalities we encounter and how to handle them. Warriors, who confront change, see possibilities, innovate and manage to win! Workers, who deal with the ups, downs and challenges of everyday corporate life dependably, and who can reliably implement the change and direction established by the Warriors. Whiners, who get through life by complaining about everything they do, who profess negativism and dissatisfaction wherever they go, and blaming others for their own shortcomings. Weasels, who lurk everywhere and threaten your career and life-goals through their own deception and insecurity and who spread these feelings quickly throughout the organization. The book is designed to help you recognize what group you fit into, give you the necessary tools to get to the group you want to be in, and learn how to deal effectively with people in each group. The book really does a great job of forcing you to truthfully analyze yourself. O’Leary warns you might not like what you find, but also is quick to point reinforce that you are in control, and you can make the changes in your life to fit into the group you desire. Even more interesting (and fun) is visualizing the people you know and placing them into their appropriate categories. We have all encountered a Whiner or Weasel, and it helps to know what makes them tick and how to deal effectively with them so that they don’t negatively impact your life. O’Leary uses the analogy to the common cold – you can’t eliminate Weasels from your life, but you can take precautions to limit the frequency in which they enter your life, and the damage that they do while they’re a part of it. O’Leary uses a mixes light-hearted humor with a fiercely intense attitude to combine a business book and a self-help book in an exciting fashion. One chapter might focus on a self-analysis; the next might be about personal stories from O’Leary’s experiences, and then about management. The book is well over 200 pages but reads at the speed of a book that’s half that. I often found myself reading several chapters in a sitting, which is a testament to the writers’ ability to hold reader’s interest. If there’s a downside (and it’s not much of one), it’s that O’Leary is so brutally honest that it may rub some people wrong, especially those who fall into the Whiner and Weasel groups. Warriors, Workers, Whiners, and Weasels: The 4 Personality Types in Business and How to Manage Them to Your Advantage is a must-read for every entrepreneur, business owner, manager, and worker wishing to learn more about themselves, take advantage of their best traits, and protect themselves from those who could sabotage their career.